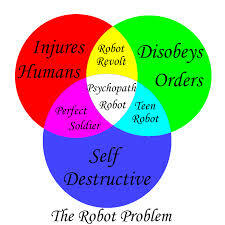 Recounts interview by a reporter of Susan Calvin, a robopsychologist who specializes in making robots seem more human. Susan tells the reporter several stories about robots that illustrate these rules and how they have impacted the development and actions of robots over the years. How would you define/explain the term robot? What does a robot look like? Do they all have human forms or can they take multiple forms? What are some robots that you encounter on a daily basis? How does our society use robots today? How does your definition of the word robot compare to these definitions?